Another annual edition of one of the most popular sports games devoted to basketball. After a several-year break, the franchise returned to the traditional annual release cycle in 2013. NBA LIVE 16 is another annual edition of the popular sports game series devoted to basketball which was started in mid ‘90s by EA Sports, which has developed every game in the series. Once being one of the leading franchises in Electronic Arts’ portfolio, in 2009, it disappeared completely from the market, letting the NBA 2K series by 2K Games take over. After four years’ break, the series came back to the competition and is being released exclusively for eight-generation consoles, such as PS4 and XONE, since 2013. The latest installment of the series includes a new superstar featured on the cover art, which a tradition to EA Sports’ games. 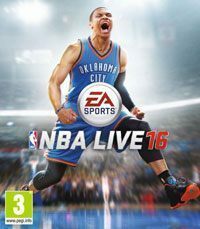 This “face” of this years’ edition of NBA LIVE is Russell Westbrook of Oklahoma City Thunder who is the best scorer of the regular season NBA in 2016. Mechanics-wise, NBA LIVE 16 doesn’t introduce any revolutionary changes although it features a myriad of improvements and modifications that influence the comfort and attractiveness of the gameplay. The most important elements are the so-called LIVE Motion, which is the system responsible for the artificial intelligence of computer opponents, and a new physics-based movement model. The latter made it possible to realistically recreate the behavior of the available players and thus we don’t get the impression that we constantly watch the same scripted sequences over and over again. The system of shots, passes, and interceptions was also completely revamped, giving the users unseen control over the ball and the moment of letting it out of a player’s hands. The system that connects the game with the current statistics of teams and players of the NBA, maintained by Synergy Sports Technology, introduced to the series with the released of NBA LIVE 14, still remains at the core of the said production. Thanks to it, the condition and skills of the available players stay up to date and reflect the present abilities of their real-life counterparts. Another notable feature is the enriched customization of our own players—including the possibility of scanning our own face (with a special mobile application) and a huge set of tattoos designed by Randy Harris, a master tattoo artist from California. Traditionally, NBA LIVE 16 offers a wide variety of game modes meant for single and multiplayer (on the same console or over the Internet). Among these, the most important ones are the full season modes, the career mode (the so-called Rising Star), and the Ultimate Team known from the FIFA series. The gameplay is enriched further with two additional online play variants which were made available to players even before the official launch of the game as a part of the special free LIVE Pro-Am version. In the first of these, the LIVE Run mode which comes back after a break, we take part in an online competition of 5-player teams that play against one another on outdoor urban playgrounds. One of the participants is our own players that develops his skill with subsequently played matches. The second mode is Summer Circuit in which we travel the United States with our team to play against the best players in every region. While playing, we face both amateur basketballers and NBA superstars, each of them having their unique playstyle. As far as the technical side is concerned, NBA LIVE 16 is powered by Frostbite, the engine known from other Electronic Arts’ games such as Need for Speed: The Run, Medal of Honor: Warfighter, and, most notably, the contemporary installments of the Battlefield series. Compared to its predecessor, the title comes with a myriad of fixed and enhancements. Especially notable ones include improved lighting effects and significantly upgraded facial expressions. The latter was achieved thanks to the constantly-evolving technology of three-dimensional face scanning. The game’s soundtrack features tens of licensed tracks, most of which belong to the rap genre. The music was composed by a DJ nicknamed MICK who is well known and respected in the USA. Before the launch of NBA LIVE 16, the developers from EA Sports released a support mobile application for iOS- and Android-powered devices called NBA LIVE Companion App. Its biggest highlight is the GameFaceHD technology that lets us scan our own face for it to be used by the basketballer created in-game.